Homolovi Now Offers 24/7 Online Campground Reservations! Reserve your spot (campground RV or tent site) from the comfort of your home, anytime of day. Make online reservations Site reservations for this park are also available by calling the Reservation Center at (520) 586-2283. You can call 7 days a week, from 8 am to 5 pm MST. There is a $5 non-refundable reservation fee per site. Starting in September, enjoy Ranger Led Tours of these important sites. Tours available Saturday & Sunday, start times vary, call the park for latest updates. Homolovi IV is the oldest of the Homolovi group of pueblos. This is a site which is usually closed to the public. A park ranger will lead the tour starting with an introduction at Homolovi State Park’s visitor center. The topic will include discussion of the history of the site and the tie to the Hopi people. Attendees will caravan in their own vehicles the 12 miles to Homolovi IV (last .25 miles is dirt road). The walking distance is approximately .3 miles on uneven ground (easy trail). 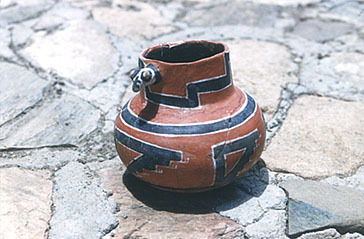 Join Park Ranger and Hopi Potter, Gwen Setalla for a discussion and demonstration of traditional Hopi pottery. She will explain, how traditional pottery is made and talk about how to recognize authentic made pottery. This will be held at the park's visitor center and will last approximately 1.5 hrs. Day use fee of $7 required. Join a Park Ranger in a tour of Homolovi's petroglyph sites. This will require participants to have their on vehicle. Please be prepared for weather and bring plenty of water as the tour will last approximately 3 hours. There will be approximately 1.5 miles of walking on uneven terrain. Reservations can be made in advance by contacting the park at (928) 280-4106 or contact Kenn Evans by email at kke2@azstateparks.gov. Day use-fee required. Join a Park Ranger on a walk to Homolovi’s mini petrified forest. This tour will explore the park’s paleontological history. The tour will require about 1 mile of walking, round trip, across natural landscape, to view an approximately 1 acre area of exposed petrified trees. The talk will describe the petrification process, the Triassic period, and the environment as it once was. Day use-fee required. 9am. Enjoy a hike along ancient trails with a Park Ranger. The tour will be approximately 2 miles on sandy trails to Diné Point and back. Wear sturdy walking shoes, wear a hat and bring water. Along the trail participants will be able see petroglyphs from Homolovi's earliest pit-house period. Day-use fee required. The park is open! Check out the photos from the Grand Re-Opening. In the high grassland of 14th century northern Arizona, an ancient people found a home along the Little Colorado River. These people, the Hisat'sinom (known to archaeologists as the Anasazi), paused in their migrations to till the rich flood plain and sandy slopes before continuing north to join people already living on the mesas, people who are today known as the Hopi. The Hopi people of today still consider Homolovi, as well as other precolumbian sites in the southwest, to be part of their homeland. They continue to make pilgrimages to these sites, renewing the ties of the people with the land. The Hopi tell us that the broken pottery and stones are now part of the land and are the trail the Bahana will follow when he returns. Therefore, these are mute reminders that the Hopi continue to follow the true Hopi way and the instructions of Masau'u. The years have brought many changes to Homolovi. The migrations ended when the people settled at the center of the world, the Hopi Mesas north of Homolovi. However, as new people appeared, such as the Diné (Navajo) and later the Europeans, the Hopi watched as their homeland was occupied by the new people. Eventually they also saw these people begin destroying their ancient homes, digging in these sacred sites for curios and for items to sell. In an effort to protect some of these sites, the Hopi people supported the idea of Homolovi State Park. This idea resulted in the establishment of the park in 1986 and the opening of the park in 1993. Although the park protects Hopi lands and cultural artifacts, the park also contains a small cemetery from a group of 19th century settlers who founded the city of Sunset. Sunset Cemetery stands as a mute testimony to the undaunted spirit of the brave pioneers who forged a living from this once desolate and forbidding land. Learn more about the cemetery in the Feature Story. You can listen online or download to your personal MP3 player ( 35 MB MP3) a tour of the Homolovi II Site. This fascinating audio tour is a great introduction to the park, and a great way to learn more about the area and its history. To Download the MP3: Windows Users: Right Click Download Link. Mac Users: Control+Click Download Link. You may also read instructions to manually import MP3s into iTunes or other software compatible with various digital audio devices. This Audio Walking Tour was made possible by a grant from the Arizona Humanities Council. This is a sacred place to the Hopi people. Each broken piece of pottery, each stone fragment, each ancient wall, and each figure pecked into stone by their ancestors is sacred and deserves our respect. In addition, state and federal laws are actively enforced to protect these sites. Removal or damage of any site, artifact, artifact fragment, or rock art can incur penalties under state law of 5 years in prison and a maximum $150,000 fine. We therefore ask that you respect the wishes of the Hopi people ... Enjoy Homolovi, but leave the sites as you find them. 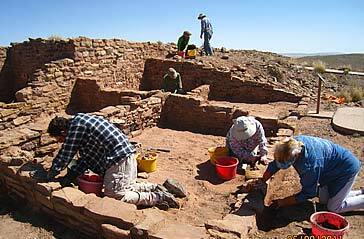 A total of 633 hours of volunteer on-site work by The Arizona Archaeological Society was carried out on the weekends of May 6-8 & 13-15, Sept. 14-18, 2011, repairing and stabilizing exposed walls at Homolovi I & II. The preservation of these walls play an important role in interpreting these Ancestral Hopi Villages to visitors. Dr. Charles Adams, Arizona State Museum, directed the project and park staff provided assistance with water for the "mud" mortar and hauled a lot of soil for the mix. The park also provided campsites and trailer accommodations for participants.